If you haven’t visited Candelori’s in Smithfield yet, it’s time to book your reservation! 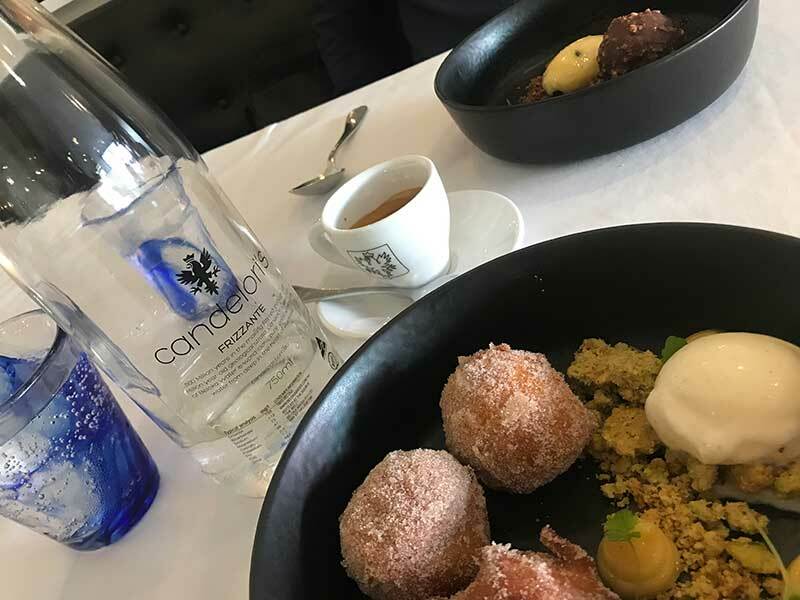 At times Smithfield’s restaurants may be overlooked in favour of more well-known establishments in the CBD and heart of Sydney: which is a shame, as Candelori’s, located on The Horsley Drive, is an absolute gem. Serving authentic Italian cuisine since 1999, Candelori’s offers an exceptional dining experience, showcasing a menu which is a skilful combination of rustic flavours fused with sophisticated styling to create a contemporary Italian dining experience which is unmissable. Couple that with the extensive wine list and range of beverages and you have all the ingredients for a memorable occasion. Candelori’s is owned by Ross Candelori, a second generation Italian immigrant. Amassing a wealth of knowledge through working at his parents’ restaurant, the Sartana in Cabramatta, Ross went on to put his own stamp on Candelori’s. Benefiting from elegant yet accessible decor, this restaurant is an ideal choice for a special occasion. Suitable for couples, groups or families who are celebrating something important, the range of dishes means that there really is something for everybody. The seafood is an absolute must! With so many tempting choices, it was a challenge to choose when we turned up at Candelori’s for lunch. 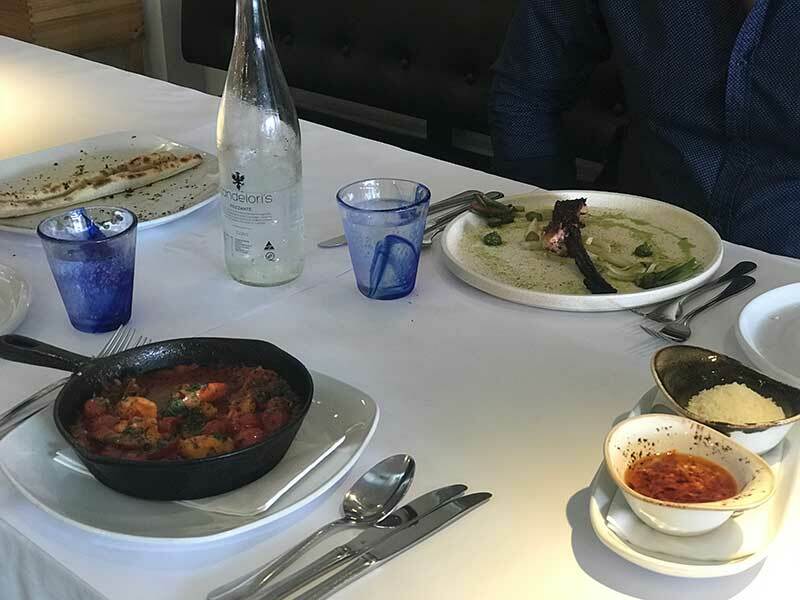 Mindful of its reputation for creating sublime seafood dishes, our starters included: garlic prawns in tegame; wood fired grissini; and charred Fremantle octopus with confit fennel. All arrived promptly, cooked to perfection and beautifully presented. Hand cut pappardelle with osso buco ragu provided the opportunity to sample Candelori’s exceptional hand-made pasta. Like everything else on the menu, it didn’t disappoint. 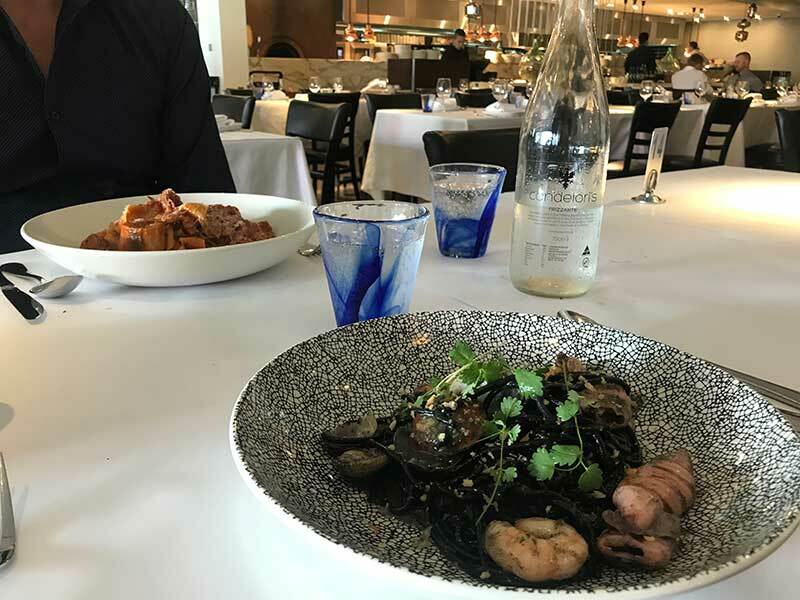 The special, squid ink tagliolini with scallops, prawns, pipi shellfish and baby squid managed to combine a selection of marine flavours to create a spectacular dish that is a must for any seafood enthusiast. It would take a strong soul indeed to resist the lure of the dessert menu: we didn’t even try! Selecting chocolate rocher, an exquisite combination of hazelnut mousse, caramel cream, hazelnut biscotti and passionfruit sorbet was definitely a good move. As were the light, fluffy ricotta bombolini: warm Italian doughnuts, lemon curd and pistachio crumble. With each component of the dessert made from scratch, the end product is nothing short of breathtaking! An espresso made from carefully prepared, single-source coffee provided a dark, rich finishing touch to one of the best lunches we have enjoyed for a long while. 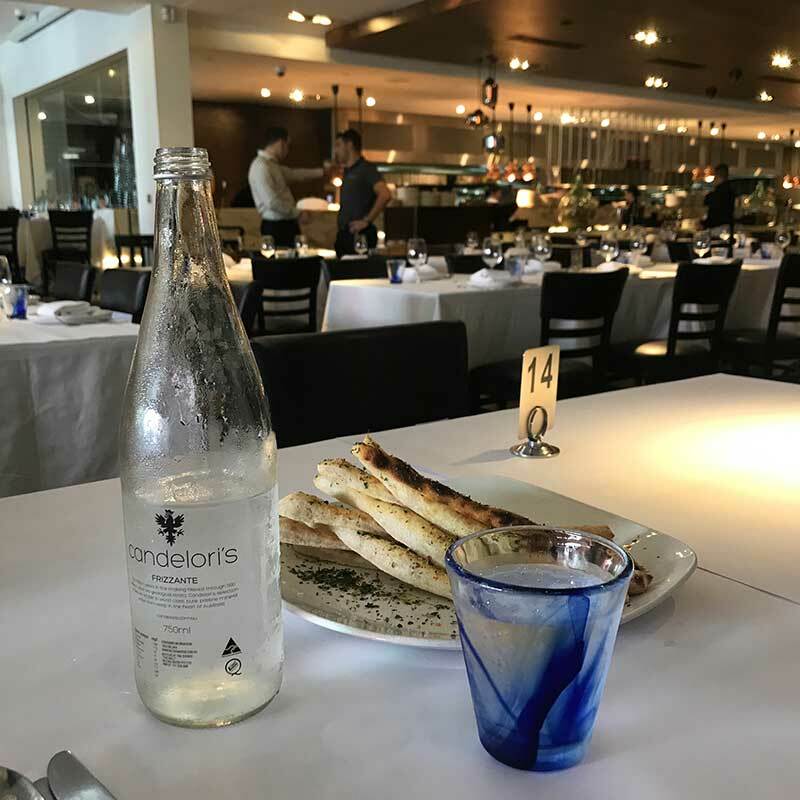 Like many people, we prefer mineral water to accompany lunch, which is why Candelori’s branded sparkling option was the obvious choice. Here at Beloka Water, we not only sell our fresh, pure mineral water under our own label, we are also able to create private labelling, enabling individual restaurants, hotels or function facilities to advertise their brand at the same time as serving a beverage that benefits from an impeccable provenance and a pleasant, distinctive taste. Candelori’s have opted for our private labelling option, enabling them to serve mineral water with their own distinctive, branded label on the front. A branded label not only looks attractive, but it also provides an opportunity to discreetly advertise your products and services to your customer base. We offer both still and sparkling own labelling options. A labelled bottle ideal for the table; it’s also suitable to serve at the bar as a mixer, perfect as a base for mocktails or juice fusions, or to place in bedrooms or meeting rooms for guests or delegates. Are you a hotel, restaurant, café, food distributor or business that understands the marketing benefits of promotional products, and thinks adding Beloka Water custom bottles to your inventory is the answer to taking your brand to the next level? Then contact us today on 1800 BELOKA.